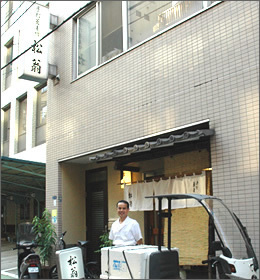 "Te-uchi ('Handmade') Soba - Matsuou" is a very famous soba shop in Kanda Sarugaku-cho, Tokyo. It's been featured in various media including a book written by well known author Shotaro Ikenami. They use our refractometers to measure concentration of “dashi” or soup stock, which plays a vital role in their house soba sauce. 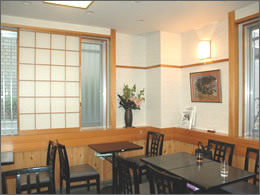 The restaurant is located in a quiet alley in Shirayama street, near Suidoubashi station. Today, we had an opportunity to talk with the owner, Mr. Matsuo Onodera. On November of 1981. I became independent when I was 31. Originally, it was a smaller shop of about 18 seats. We moved to our current location in 1998. My father named it after my name Matsuo. What's special about your soba? I am very particular about the quality of ingredients I use. For one, I do not use any artificial flavoring. Before becoming independent I worked at another soba restaurant, and I was shocked to find out that their "secret ingredient" was artificial flavoring. I knew that it was becoming more common for restaurants to use them, but I promised myself to stick to only natural ingredients. 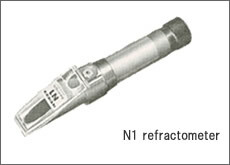 That’s when I started using refractometers to measure concentration of dashi. Back then I was using an ATAGO N1. I took measurements every 5-10 minutes for two hours, and noticed that concentration does indeed keep changing. I did a lot of experiments to find out the relationship between refractive index and the timing at which maximum umami is extracted out into the stock. For example, after straining, I taste the bonito flakes to check how much flavor remained. From such experiments I also realized that amount of extraction differs with thickness of bonito flakes, so I repeated the first experiment with various thickness of bonito flakes. From what I found with all my experimentations, it's best to shave dried bonito very thin, right before use. I've found the perfect balance to be 8% bonito flakes in water, though this could vary a little depending on the quality of bonito. Is 8% high or low concentration? Also, is this confidential information? I think it's higher than average. Typically it is about 4 - 5%. This is not confidential; even if someone tried to make their stock with 8% bonito, they wouldn't be able to make it the same flavor as mine. I think it's important that everyone comes up with their own flavor. For example, even with same ratio and recipe, dashi concentration can vary by day, as I've recorded here - 1.3%, 1.4%, 1.7%. There are various factors, such as when and where the bonito was caught, as well as flavor and fat content of bonito. Also sometimes bonito can be more salted than others, which can affect the flavor. Is there a way to differentiate better quality bonitos? Yes, I examine by its texture, firmness, and sound. At first I had no way of telling. I visited Kyushu, Sapporo – known as Japan’s best production site of bonito flakes - to learn all the tricks. Another important component of dashi is konbu (seaweed). I don’t measure refractive index for konbu-dashi because the concentration is typically very low. When our shop first opened, we were on a budget so we were using inexpensive Hidaka konbu to take dashi. From there I progressed to Rikyuu konbu, and now I’m using an all-natural konbu from Hokkaido. For condiments, I also only use brands that use all natural ingredients. I went to all their manufacturing sites to make sure it was really what I was looking for. I am also very particular about the shrimp I use for tempura. I used to use frozen shrimps, but with those the tails come out dark when cooked. Only fresh shrimps have that pretty red color. So I started buying fresh shrimps, but the problem with that is the inconsistency of stock and high cost. 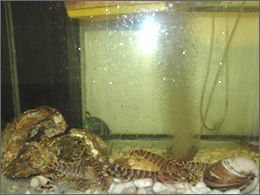 As a solution, I installed a fish tank in my store so I can keep live shrimps on hand. Another very important ingredient is buckwheat flour that I use to make soba. I import it directly from a farm in Ibaragi. I also make a visit there periodically. I found that right after rainy the season, noodles tend to break apart easily. Same happens when you leave it too long after it has been ground. I installed a flour mill at the shop so I have fresh ground buckwheat flour daily. It takes about two hours to grind, and then it needs to be shifted, so we prepare the flour a day ahead. 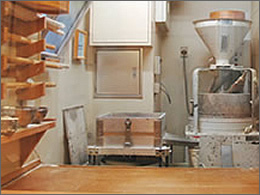 Flour mill and soba making station is surrounded by a glass so that customer can see the whole process. 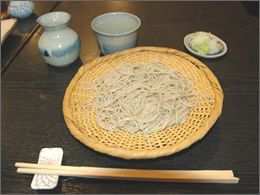 Matsuou also has a daily menu, featuring many unconventional flavors of soba. 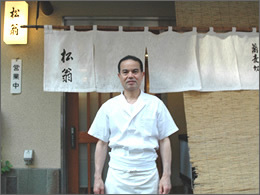 Mr. Onodera clearly has strong passion for soba, and his attentiveness shows in every detail of soba making process. Much labor and time is put in his product, not to forget the superb quality backed up by his own evaluation. We hope everyone will get a chance to try! Mr. Onodera, thank you for your time and the delicious soba.